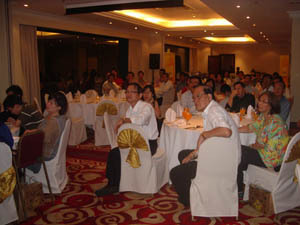 SMA New Year 2012 Gathering was held on 18 February 2012 at Riverside Majestic Hotel, Kuching. DIGI Telecommunications Sdn Bhd sponsored the dinner and door gifts. 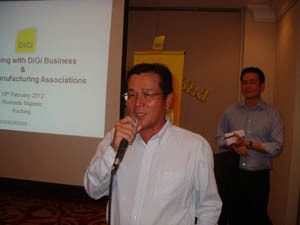 Speech by Mr. Joseph Lau Ka Hoo, the Secretary –General. 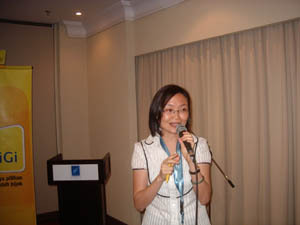 Presentation on DIGI products and services by Ms Tay Soo Yii, Head of Sales, SME Sarawak, DIGI Telecommunications Sdn Bhd. Mr. Benny Wee (left), the Head of Region Sarawak, DIGI Telecommunications Sdn Bhd was presenting a lucky draw gift to Dato' Hii Ngo Sing, Honorary President. Mr. Joseph Lau Ka Hoo (right), the Secretary-General was presenting a lucky draw gift to Mr. Yeo Jui Yong, the Treasurer. Mdm. Mariana Ung Siew Chin (left), the Vice-President was presenting a gift to a lucky draw winner.